Food supplements with vitamins & minerals with sugar & sweeteners. Take without food or water! Contains Vitamins A, C, D & Zinc scientifically proven to help maintain normal immune function. 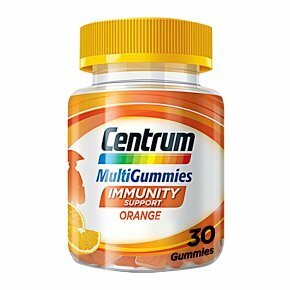 Centrum MultiGummies Immunity Support are a deliciously fruity way to help you suport your immune function. Available in Orange flavour, made with natural colours & flavourings. Centrum MultiGummies Immunity support provides you with a balanced formulation of vitamins & minerals and with no need for food and water, you can enjoy them whenever and wherever you want.